In our vision of building an ecosystem of the Future of Finance, we are developing partnerships with similarly bold and driven companies. Today, we are proud to announce an agreement with Securitize, a turnkey, white-label solution for the tokenization of securities issued by funds, companies, and other entities. The mutually beneficial partnership will provide additional industry support for Securitize’s Digital Securities Protocol (DS Protocol) and facilitate the compliant trading of security tokens issued by Securitize. 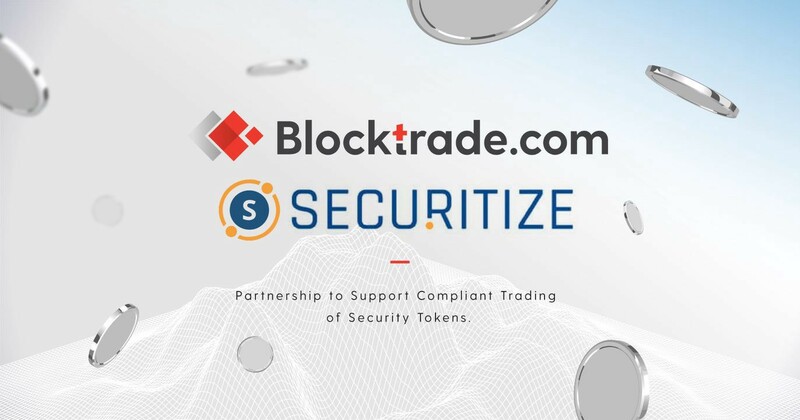 All current and future security tokens issued by Securitize will be eligible for listing on Blocktrade.com’s fully regulated trading facility. In addition, Blocktrade.com has agreed to adopt and advocate Securitize’s DS Protocol. “The partnership of our companies is intuitive as we stand for the same values — trust, cooperation, and transparency. We both recognize that security tokens are the future of finance and together with Securitize we are building an infrastructure that will unlock a vast amount of liquidity on the market,” states Luka Gubo, the CEO at Blocktrade.com. Securitize is a software platform for issuing and managing digital securities including dividends, distributions, and share buy-backs. Securitize’s innovative Digital Securities Protocol enables seamless, fully compliant trading across multiple markets simultaneously. As a market leader, Securitize is heavily invested in the overall security token space and actively partners with exchanges, broker-dealers, custodians of crypto, escrow services, and other financial infrastructures for security tokens.